Major League Baseball’s excellent At Bat iPhone app is back for another season, this time at its most expensive price ever: $14.99. And so far, the app is tearing up the charts, despite its price tag. At Bat 2010 is already the no. 8 most popular paid app on iTunes. That’s because even at $15, the app is a great value for baseball fans. It includes live audio streaming of all games — this year, including a trick that will allow it to play audio in the background while you’re using other apps — and one live video game streamed per day. 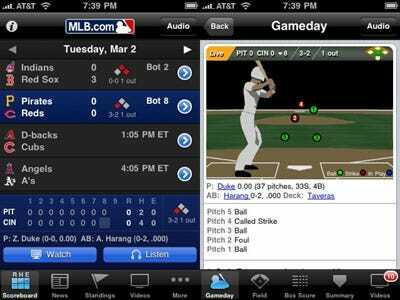 Subscribers to MLB.TV, the league’s excellent Internet TV service, will be able to watch all those games live on the iPhone again, just as they were able to in the last few months of the 2009 season. We’re anticipating a separate iPad app from MLB.com once Apple’s tablet goes on sale later this month, potentially including hi-def video playback. MLB Advanced Media was one of the few companies hand-picked by Apple to test early versions of the iPad and demonstrate at its iPad unveiling event in January. MLB promises more features to appear during the season, too. Additional features will debut during the season, including a suite of ‘At The Ballpark’ advantages in At Bat 2010, from customised, proprietary content to fan-experience tools and more.